BRIGHTON, Mich. Feb. 24, 2012 - We have all seen the Ford commercials advertising all of these crazy technological features. If you’re like most you wonder what these features actually do, if they really work, or if you really need them. We wanted to clear up any mysteries and show you first hand some of the awesome features in action right here in Brighton, not in a commercial on a closed course. To demonstrate these features we took the 2012 Explorer out around busy downtown Brighton. Every great journey starts at the beginning, and in this case, with the push start feature. Apply pressure to the brake and press the ignition button and just like that, your Ford fires right up. AV plugins and USB plugins allow you to connect media devices to your Ford so you can take your entertainment on the road with you to play through your MyFord Touch with SYNC. 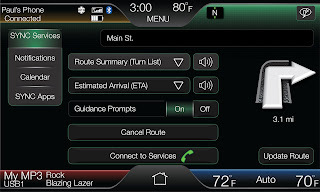 MyFord Touch and SYNC do much more than keep you entertained, it’s a virtual co-pilot that will help you navigate, make and take phone calls, and even can give you a vehicle health report for your Ford. Taking your Ford on an adventure has never been easier with the Terrain Management System. Turn the dial to match the road conditions and you’ll have much better traction control for your off road expeditions and drives on the snowy and muddy Livingston County back roads. With full rear climate control, including head and feet directional settings and 110-volt outlet your back seat passengers can plug in portable DVD players, phone and game chargers, and much more so they can stay entertained while you stay focused on the road. Another fantastic feature available on many Fords is the rear view camera, which displays what’s behind you on the MyFord Touch display. The guidelines show you an outline of that’s in between your tires, your distance away from objects, and a directional guideline that shows you exactly where your heading. The rear view camera preludes possibly the best feature on many new Fords, the Active Park Assist. Just press the button and your Ford will parallel park itself, its that easy! The Active Park Assist feature takes control and flawlessly parallel parks your Ford for you, perfect for parallel parking on the busy streets of downtown Brighton when you are going out to eat at Lou and Carl’s or Bagger Dave’s or to shop at Impulse. Here’s how it works: You press the Park Assist Button to engage the Park Assist mode. Your Ford then scans the right side of the road for a break between cars to locate a fitting parking spot. Once you’re asked to stop and put it in reverse and your Ford will take it from there, keep in mind you still control the speed and the shifting. Don’t be afraid, take your hands off the wheel (keep a foot on the brake) and watch in astonishment as your Ford seamlessly maneuvers the parking task many drivers fear more than anything. Park Assist is available on the 2012 and 2013 Explorer, 2012 Escape, 2012 Flex, and 2012 Focus. Come into Brighton Ford for a test drive and experience these amazing features for yourself.